RAK Ceramics’ stand at the event. 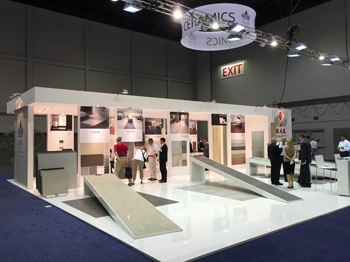 UAE-based RAK Ceramics extended its global presence by participating for the first time at Coverings Exhibition held last month (April 14 to 17) in Orlando, US. A hi-tech global manufacturer of lifestyle ceramics solutions, RAK Ceramics said its ‘Maximus Mega Slab’ was a hit at the exhibition, opening doors to the most influential global buyers within the industry. The exhibition, which is the largest tile and stone exhibition in North America, attracted more than 1,000 exhibitors from more than 40 countries around the world who showcased cutting-edge products, trends and the latest innovations. Maximus Mega Slab, which was launched at Cevisama, Spain, in February and at Revestir in Brazil, took up significant space in RAK Ceramics’ 185-sq-m stand. Measuring a gigantic 1.5 by 3 m, the slab is the largest Gres Porcellanato tile manufactured in the region, and can be used to easily replace any type of surface, particularly kitchen worktops and bathroom vanity counters, the company said. Abdallah Massaad, RAK Ceramics CEO, said: “These global exhibitions are very important to RAK Ceramics as it confirms our commitment to our global stakeholders and facilitate our strategy implementation, including growing our B2B business. Other RAK Ceramics products that were showcased at Coverings Exhibition included Surface, Evolution, Indus, Yukon and Lounge as well as the Basic, Made and Hermosa Series.